A number of LJ’s have written about the quality, problems, solutions and modifications concerning the Harbor Freight 2 HP 70 gal. dust collector. We have encountered all the same kinds of problems and decided to modify the unit. Minimizing equipment footprint is always a concern due to shop space. The HF DC took up additional space because the dust collector dual 4” plastic dust inputs extended out over the carts side footprint. In addition the base was flimsy as other LJ have indicated. When we saw how LJ GJK combined the HF 24” x 36” Folding Platform Truck with the HF Dust Collector. That inspired us to modify the configuration of the dust collector and eliminate the flimsy base, then see if we could bring the dual 4” plastic “Y” into the carts rectangular footprint. Our solution was to eliminate the entire original base and mount the DC unit parts directly onto the Platform Truck. That’s a cool mod. This DC has become the hobbyist’s go to DC for “personalizing”. I mounted my in a corner of the shop and vented it outside. That greatly lessened the footprint. NOTE: When not doing lawn duty, my HF collector sits at my miter. Generally, I’m pretty happy with its performance. It won’t replace my other two collectors, but it’s a vast improvement over the little one horse Delta I started the lawn cleaning (pine cone vacuuming) experiment with. If I’d seen Wuddoc’s approach, I could have still had a sturdy cart and in a fraction of the time and at a reasonable cost. Too, I think his cart approach would accommodate the larger wheels just fine. For dragging the unit out into the lower yard, I should, probably, add a couple rods between the handle and flimsy bag supports (just cause). What do those carts run? 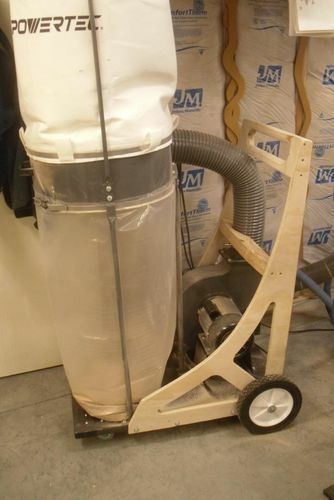 Pretty cool…..I’m rethinking a HF dust collector!